Successfully Added The Vision Quad Band, Dual SIM World Phone with Accelerometer to your Shopping Cart. In our continuing efforts to bring you cutting edge cellphones, say hello to the CVCN-M47, also known as The Vision. Bringing you an ultra modern feature set, The Vision is an unlocked, quad band, dual SIM mobile phone with all the awesome features you demand from a top of line cellphone. First, quad band functionality allows this phone to operate in all of the four worldwide standard GSM frequency bands. Second, this a Dual SIM with Dual Standby mobile phone meaning that you can insert two SIM cards into this phone and have two active phone numbers. That's right, ONE phone, TWO different cellphone numbers! Receive calls from either SIM card and press either the SIM1 or SIM2 dial button on the front of the phone to choose which number you want to dial from. Great for the businessman or frequent traveler! The CVCN-M47 is designed like a cellphone should be. Where the keypad should be, the screen has been enlarged to provide maximum visibility. But don't worry, when you need to make a call, press the menu key and a virtual keypad materializes on the touchscreen. Just tap the number you want to dial with your finger or the pen stylus included (it's housed in the lower right corner of the phone). Same goes with SMS, MMS, emails, and other features requiring text input - whenever the need arises, a virtual keyboard will appear on the phone's ultra responsive touchscreen. Aside from call functionality, this uberphone comes with a digital camera, video recorder, video player, audio player, image viewer and it even lets you record from FM radio, making it a palm-sized multimedia powerhouse! Accelerometer motion sensing also comes standard so a simple flick of the phone allows you to change everything from the wallpaper to what mp3 you're listening to. Load some movies and songs into the phone by microUSB cable (yes, it's compliant with recent decisions for one mobile phone connector type standard) or microSD card and suddenly you have a party on your hands. WQVGA resolution and three speakers (one in front, two in back) will ensure that your media looks and sounds its best! It also bears mentioning that this phone's media player is anything but average. Aside from following user specified lists, it can also auto-generate playlists. You can repeat one or all tracks, toggle the shuffle features and this phone even has dual zone, which means you can listen to FM radio or your own music in the background while you're using the other features of this phone. Customize the phone to your heart's desire. Switch wallpapers, screensavers and aside from 25 ringtones for you to choose from, program your own by choosing tracks you've loaded in your microSD card. We could go on and on about this great mobile phone, but you really have to experience it for yourself. Click "Add to Cart" right away to buy one for yourself or be the first on eBay to offer your customers The Vision. Brought to you by the leader in wholesale direct from China electronics - Chinavasion. For improved FM radio reception, the earphones act as a power antenna. The phone itself can store 1,000 contact records. SIM cards usually hold 250 contact records. Therefore, the phone and 2 SIM cards can hold 1,500 contact records. The phone charger / transfer cable uses a micro USB connector. This is compliant with a recent decision by major cellphone manufacturers to make the micro USB connector standard on all future cell phones. 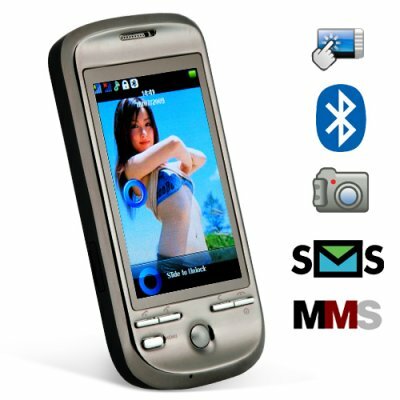 This mobile phone uses a virtual keypad for dialing and a virtual keyboard for text input. While you are in conversation, the menu will display a recording option that isn't available when you're not on a call. on 2009-08-14 11:17:32 My customers love this phone!!! on 2009-08-13 10:46:30 The best of best I've bought! So thoughtful and excellent execution will make the honor of any brand! And even if I didn't find some function - this fact cannot diminish the admiration that I experienced from this phone. on 2009-08-05 21:33:02 very good!!!! excelente movil, muy bonito y con una presencia insuperable!!! !